This post is a continuation of Hobo Mama's celebration of Attachment Parenting Month, October 2009. This article focuses on the sixth principle of attachment parenting: Provide Consistent and Loving Care (Beware of Baby Trainers). — is a little murky sounding to me, but it has to do with who takes care of your children on a regular or occasional basis. The AP ideal is for parents to do most of the parenting, and to make sure alternate caregivers are bonded with the kids and provide the same type of respectful care you would choose for them to receive if you could be the one providing it. Well, I started thinking of this topic and it turned into a mushy mess in my head, all sorts of guilts and mommy wars and pressures and SAHMs and WOHMs and feminism and religion and everything, all at once, duking it out in my tired brain. And it is a tired brain, because it had hoped the state auditor had forgotten us, but no such luck, and it is facing down NaNoWriMo set to begin in a couple days, and it's feeling exhausted from trying to write a post or more a day, because apparently it is fairly lazy. And after all that, my brain just let out a great big sigh and refused to work anymore. Therefore, I bring you an expanded book review. It's not cheating, because it's actually what I'd intended to write in the first place, when I planned out my week and a half of AP posts. It's just that I later decided maybe I should add some incisive commentary on why some parents think they must be the only caregivers, and why some parents think it's no big deal to hand off care of their children, and why I'm stuck somewhere in the middle, thinking that it's good and natural to have the resource of loving alternate caregivers, because children can and should bond with other carers, and parents but especially mothers should not feel they have to do it all alone, but meanwhile I also want to be primary, but sometimes I get overwhelmed and bored, and there's breastfeeding and...oh, no, my brain just shut down again. Nope, never mind. Book review, and that's a wrap. To start from the basics, a babysitting (is it really necessary to hyphenate that? Blogger spell check says yes; I say no. I win.) co-op (I'll give in with the hyphens here, so it doesn't look like a home for chickens) is a group of parents who decide to share babysitting duties. I suppose it could look different for different groups, but generally babysitting means for an occasional, few hours out, not all-out child care such as would be needed for full-time work hours. It is a co-op, short for cooperative, because the members involved are all invested in the group, giving and taking in turn. The co-op operates on a point system. Parents earn points by sitting for other kids; they spend points by taking advantage of sitting. • You don't have to pay for babysitting. • Usually, the co-op members doing the babysitting for you are familiar to you, or even friends. • However, unlike with friends or family, there's no guilt involved and no uneasy exchanging of favors. The point system keeps things fair. • As a member, you can sit or be sat for as much or as little as you want. There's no obligation when a particular opportunity to sit comes your way. • You can do things you might not otherwise if you had to find and pay for a sitter: Go out for a date night to an over-21 comedy club (we did that once, and even enjoyed a drink! ), run some errands during the day, meet a friend for a leisurely lunch and uninterrupted conversation, go to a personal or professional appointment, spend some special time with just one of your kids, etc. Since our only sitter is Sam's sister, and she's not always available, we tend to keep our outings Mikko-friendly, but that can be limiting when your 2-year-old wants to stand up in the booth and shout to other patrons rather than allow you to have a conversation with your friends, or when he would like to stab his knife into your food, pick all the sesame seeds off your hamburger bun, and fish ice cubes out of your water glass with his crumby fist, and you would rather, say, eat in peace. Not saying this has happened to us, I'm just saying. All right, it happened to us tonight. So, sometimes, we want some Mikko-free time, but for one reason or another Sam's sister is unavailable, and then we're stuck with the unappealing options of scouring Craigslist for someone who's preferably not a mass murderer, or tearing off a tag of a flyer a 13-year-old girl tacked onto a bulletin board at the dance school and hoping she's not as flighty and uninterested in actually caring for her charges as one young babysitter I had the horror to witness in person. So, when I got this idea that it would be good to start a co-op, I did what I always do whenever I have a harebrained idea: check the library for any books that can fuel my cravings. As it turns out, there aren't books plural about co-ops. There is book. 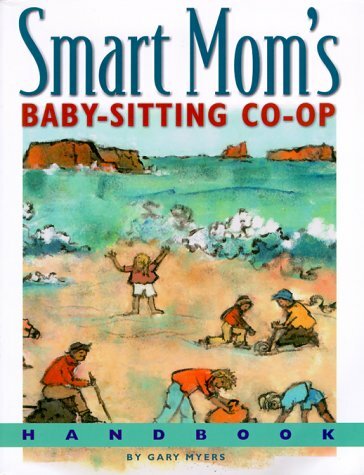 There is Smart Mom's Baby-Sitting Co-Op Handbook . So I recommend it, but I recommend it with the caveat that I might be more discriminating if there were several options to discriminate among. 1. It's written by a man, but it's titled for a "Smart Mom," the subtitle says "how we solved...," and the photographs on the back show smiling middle-class white mommies. Nothing wrong with them, since, you know, I am one and all. I just didn't know what to make of the disconnect there. Then you open it up, and the emphasis is on moms, for sures. Not just any moms, but the stay-at-home variety. Again, that's not a problem, per se, but I have a broader dream for my co-op, that fathers and mothers are both welcome, and sometimes the mothers might work outside of the home. I'm cool with that. The book is implicitly not. In some cases, it's even explicitly, as when it says that no one but the mother is a member of the co-op. I have a desire for Sam to be part of the co-op, and for other fathers to be included as well if they wish, and in my circle, that doesn't seem to be as much of an issue as in the book's milieu. The book also makes it clear that the co-op is for parents (mothers) of preschoolers only. I'm not sure why this is. I really like the idea of a continuum-like tribe of mixed ages of kids, with friendships continuing into school years and beyond. It makes me wonder why the book limits the babysitting to preschoolers — is it that older kids are harder to sit for, or that they don't need sitters as much? Is it that parents of younger kids couldn't presumably handle sitting for someone's older kids? Is it an assumption that older and younger kids wouldn't be able to get along in a group? I don't know why the book imposes that restriction, but those obstacles don't seem insurmountable to me. 2. As the one negative reviewer on Amazon pointed out, the font is a little goofy. Just in general, the book smacks of being a home-grown project. It's not organized in ideally the way I would have wanted, and the writing is a bit "here's what worked for us!" But I'm OK with that. It's a group of people who had this work out for them, and they want to share it. Some of the tips, and some of the chapters even, might not be helpful or are too nitty-gritty (the negative review mentions the book advising how to make a poster), but I appreciate that they're trying to be detailed and show specifically how these techniques worked for their group. 3. Now, that same group is also trying to capitalize on their monopoly of the babysitting co-op handbook market and get you to sign up for their group and pay them yearly dues. That can get a little creepifying if you don't like being pitched to, and if you don't see the benefit in having a mother organization overseeing your local co-op. Our group personally doesn't like the idea, but I can't fault the Smart Mom's group for trying to make a few more bucks off their ideas. They do give a lot away for free on their website, and for cheap or free through their book (depending on if you buy it used or check it out from the library!). 4. There are aspects to the book that I didn't agree with or that didn't seem necessary to me. This doesn't bother me unduly, and it may turn out that I'm wrong in dismissing their ideas, considering that they've been successfully managing a co-op for years, and I haven't started mine yet. Examples of things that didn't resonate with me: Charging the members dues for things like sending birthday cards to members (eh...whatever, was my thought) or for door prizes at the meetings (sounds kind of convention-y and artificial). Doing a pre-joining inspection of every potential member's house for safety hazards; I can see where this would be a good idea, but I'm not sure that we'll actually swing it. Having an established and rotating hierarchy of leadership, with a president and secretary, and passing along a physical three-ring binder from one secretary to the next; we have the idea to go with a website and do scheduling all online and have the government be more autonomous. That last one may prove to be disastrous — see what I mean? But I like that the book gave us an idea and yet we were able to formulate our own opinions and plans using the book as a springboard, not a blueprint. And that's a good segue into what I really like about the book. It is very thorough and hands-on as to how to start a babysitting co-op. It tells you, in detailed fashion, how they in particular arrange all the aspects of their co-op: recruiting members, ideal size of the group, organizing the leadership, calculating points, vetting potential members, dealing with canceled sits or delayed sitters, the differences between nighttime (bedtime) and daytime sits, how to cancel out points when members leave, awarding bonus points, not letting parents pick favorite sitters, agendas for meetings, and so on. One of the most helpful elements was the points chart. Basically, for each hour of a sit, you earn or spend points based on how many children are being watched. So if you have four children, you'll spend more points going out for dinner than someone who has only two children. The chart does all the math for you. You can just run your finger down the column that shows how many hours you need sitting and match that with the column for how many children you have. I'm not saying you couldn't do this simple math yourself — I'm just saying that I was glad that the book had figured out the points system, in general, so that I didn't have to. They've used this point system and think it's fair, and it seemed reasonable to me. The points system included tips on how to award bonus points to people who did something extra for the group (such as hosted a co-op meeting), and how to subtract points when people screw up and don't show for a sit. It even suggested fun ways to get people spending or earning points, such as to offer incentive points as unexpected prizes. The book maybe went a little overboard in obsessing over how the points of the group as a whole absolutely always have to balance out to zero: If someone moves out of the group and leaves points behind, the book's suggestion is to distribute the (negative or positive) points to everyone else; my suggestion is to just let the points lapse into oblivion, but maybe I'm missing something there. I did like how the book deals reasonably with the idea of positive and negative points. They set a maximum that you personally can be either above or below zero before you have to take a step toward equilibrium again. For instance, if you've just had a new baby, you might spend points by getting sits done for you for several months before you feel up to sitting again. According to the book's system, that's just fine, and I liked that freedom. But then I also liked that there was a limit that forced you, at that point, to try to balance out the scales. For instance, if someone had been sitting up a storm, the maximum would make sure she also took advantage of some time off and spent some points to go do something fun. The book also mentioned a lot of nitpicky details I might not have considered but am glad I have now, like having on file a medical consent form for each family that includes information on medications or allergies. Another detail was that nighttime sits are worth more points than daytime sits, and usually the sitter will perform the sit at the other family's home. The book, in its SAHM mindset, says that the babysitting mom will go to the other family's home and put the kids to bed there, leaving the dad behind at their house to have some special (rare?) time caring for his own kids. I don't know if that's exactly how things will pan out in our cooperative, but it was interesting to hear how they deal with evening sits that overlap with competing families' bedtimes, since it was something I was wondering about. In the end, what I took away from the book was a very rigid, detailed system for managing a large babysitting co-op. What I changed it to in my mind, and in my talking with the friends who are interested in starting the co-op with me, is a smaller, more flexible babysitting cooperative, with a wider inclusion of co-parents and ages of kids, and with an emphasis on online technology. The idea of using a website and email lists was pretty much missing in the book — even though, as I mentioned, they do have a website, and it includes a paid option for tracking points online, though there are still paper records to keep. In our group, one of the members has volunteered to set up a simple website that will allow us to track points, and we'll use group emails to send out and answer sitting requests. We're hoping that will work to keep the group manageable without having a specific leadership structure, or a secretary to manage calling a list of members each day to arrange sits. We're looking forward to having meetings together of the co-op members, as well, even though we won't have door prizes (! ), because it will give us a chance to get to know each other a little better, and for our children to interact, outside of the babysitting itself. So that's my take on the book Smart Mom's Baby-Sitting Co-Op Handbook . Now we just have to actually start the co-op and let you know how the book's advice, and our own tailoring of that advice, pans out.